The salt, wind and snow can really wear on your home and office, inside and out. To lessen the damage, it’s best to take care of your windows, floors and carpets as soon as you get a few nice days on the calendar. The outside of your windows collect the most dirt and grime buildup, thanks to their direct contact with the winter elements. Schedule regular maintenance cleanings of your office windows with the Naps cleaning crew to prevent permanent damage from the elements. Wait for an overcast day to clean home windows so the glare of the sun won’t disguise any streaks on the glass. Cleaning windows thoroughly not only means inside and out, it means the sills and grooves, and the screens, too. If you want windows to look clean, they also have to be clean on the outside. Check around your window frames to make sure the winter weather hasn’t caused any deterioration to the rubber and seals around your windows. That deterioration can cause an increase in electric bills, and also let dirt, allergens and bugs get inside. Make sure there are no leaks and cracks around your windows which can cause wood around the windows to deteriorate. Cleaning the screens:BClose and seal your windows before heading outside. Prop the screens against the side of the house, use your broom or brush to remove debris from the screens and tracks. Use a cloth or sponge to clean the frame and tracks a bit deeper, then scrub them with a non-abrasive brush and a household cleaner. Rinse both sides with the garden hose and let them dry before replacing them. If your windows are different sizes, mark where each screen came from or leave them sitting under the appropriate window. Clean the outside-facing window panes while the screens dry. Inside: Lay down a sheet or towel under the window to catch any drips. Use a fresh detergent and water mixture and a clean sponge or cloth. Wipe down the frame and sill, paying attention to locks and any cracks or crevices. Then carefully but thoroughly clean the panes of glass. If you can, tilt the window sash in to easily clean the outside of the glass while you’re inside. Do a second cleaning if necessary to remove stubborn dirt or debris. Winter weather brings the challenge of keeping floors and carpets clean and looking great. Ice melt, rock salt, water and dirt can leave carpets and flooring surfaces looking dull if not addressed. These things find their way in on shoes and boots, clothes and winter garments. Salt is capable of leaving damaging stains on any material or surface it lands on. Floors: No matter what the surface, sweep thoroughly first. The salt and debris that has entered your home or office has probably found it’s way to corners and under furniture. Make sure you get in to these tiny and hidden places before you use any wet cleaner on the floor. It’s a good idea to rinse with warm water, then wipe with a non abrasive cloth to ensure that all of the salt and stains have been completely cleaned away. Carpets: Whether it’s the entrance to your home or your office lobby, rock salt and gravel can get dragged in and embedded in your carpet. To protect your carpets you’ll want to vacuum regularly, and once a week do a more intense cleaning. Move furniture from your carpets before you begin. Debris can find its way under legs of couches and chairs, tables and desks. If there are stains on the carpet use a mild cleaning solution to blot on stained areas, then dry with a soft cloth. Repeat again if stubborn stains need more attention. 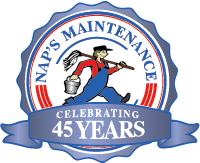 If your home or office carpets and floors are suffering from winter wear and tear or if you are ready to let a professional invest their time in cleaning so you don’t have to, contact Naps today and let us create a cleaning program for you.